Snowmass Picnic by Slim Aarons - 12.000" x 11.875"
Snowmass Picnic wood print by Slim Aarons. Bring your artwork to life with the texture and added depth of a wood print. Your image gets printed directly onto a sheet of 3/4" thick maple wood. There are D-clips on the back of the print for mounting it to your wall using mounting hooks and nails (included). There are no comments for Snowmass Picnic. Click here to post the first comment. 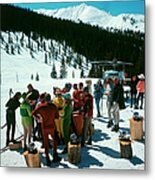 1967: A stand-up fondue picnic for skiers at Snowmass-at-Aspen, Colorado which has more than fifty miles of trails and snowfields. The village was opened in 1967. 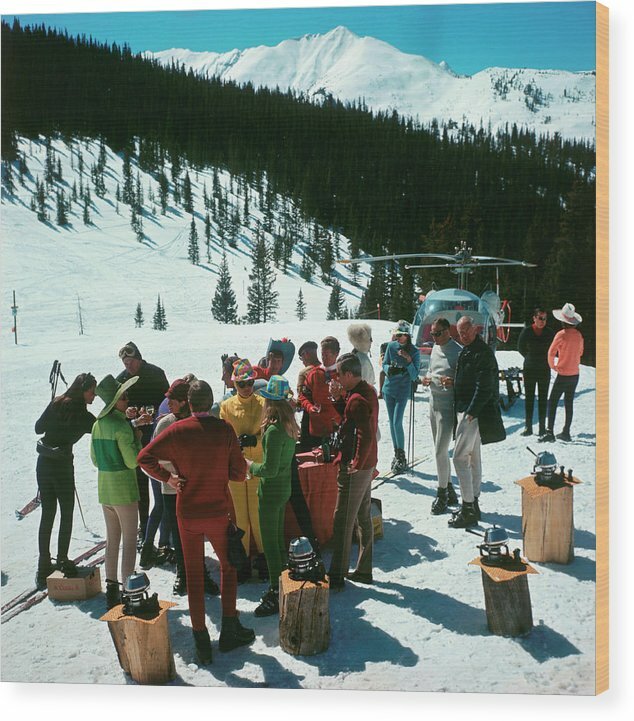 The ski picnic was organized by Holiday magazine, with the helicopter being used to bring up hot food. 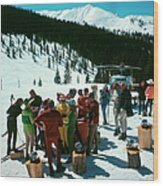 The guest list included Howard Head (1914 - 1991) of the Head Ski Company, president of IBM Thomas Watson Jr. (1914 - 1993) and his wife Olive (nee Cawley, 1918 - 2004), Norwegian Olympic skier, Stein Eriksen, and American restaurateur Armando Orsini (1923 - 2011). Original Artwork: A Wonderful Time - Slim Aarons (Photo by Slim Aarons/Getty Images)Image provided by Getty Images.